We are pleased to announce that Andreas Lundell, Jan Kronqvist, and Tapio Westerlun from Finland have won the 2018 COIN-OR Cup for their work on “The Supporting Hyperplane Optimization Toolkit” (Shot), a new COIN-OR solver for MINLP (Mixed Integer Non-linear Programs). You can read about this solver at optimization-online.org, find the code at the COIN-OR GitHub site, and view the celebration on twitter. All COIN-OR members are invited to participate to the general meeting that will take place on March 21st, 3:30PM EST (estimated duration: one hour). given below. The Agenda is below. The meeting serves several purposes. 1) Discussion of strategy for the upcoming year. 4) General discussion and feedback with board members. Please join if your schedule allows! 1) Election of officers. President: Matthew Saltzman. Secretary: Giacomo Nannicini. Treasurer: TBA. 3) Consideration of the updated mission statement below. of CCGO relies on COIN-OR software. There’s a great overview of software available for optimisation in Optima (volume 103, 2017), the Mathematical Optimization Society Newsletter, including the article “A Lightning Tour of the Optimization, Modeling Software Landscape” written by COIN-OR’s chair Matthew Saltzman. This newsletter also includes a good tutorial for COIN-OR’s PuLP, written by its developer (and optimisation guru/consultant) Stu Mitchell. 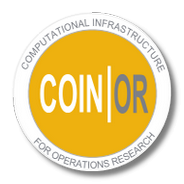 The 2016 COIN-OR Cup is awarded to Giacomo Nannicini (IBM T. J. Watson Research Center) and Thomas Wortmann (Singapore University of Technology and Design) for their contributions to model-based optimization for architectural design. The twelfth annual cup was awarded based on the RBFOpt and Opossum packages developed by the awardees. RBFOpt has been in COIN-OR since 2015 and is a python library for blackbox global optimization in settings where the objective function is computationally expensive to evaluate. Opossum is a plugin for Grasshopper — a generative design language popular among architectural designers — that provides a GUI to RBFOpt. This year’s committee commended the awardees for their simultaneous valuable contribution to COIN-OR and effective use of COIN-OR software. By lowering the barrier to entry, RBFOpt and Opossum are bringing state-of-the-art optimization to new communities and exciting classes of problems. This year’s Cup was awarded at a celebration at the Flying Saucer in Nashville, Tennessee, during the INFORMS Annual Meeting. Announcing the twelfth annual “COIN-OR Cup” competition, sponsored by the COIN-OR Foundation. * The winner must accept the prize in person at the 2016 INFORMS Annual Meeting so we can all celebrate appropriately (see “Celebration” below). * Submission deadline: Friday, October 14th, 2016. * We especially encourage nominations of effective use of COIN-OR that the community may not know about. Please e-mail your submissions to coin-cup at coin-or.org. A new version of OpenSolver for Google Sheets added support for the COIN-OR CBC solver via NEOS. This free app allows LP and IP models to be formulated and solved online within Google Sheets. For more details, see here. RBFOpt is a library written in Python for black-box (also known as derivative-free) optimization. It is a global solver that requires zero-order information – just function values, not even gradients! RBFOpt is aimed at finding the global minimum in a small number of function evaluations, which is particularly useful when each function evaluation requires an expensive computation, e.g. a time-consuming computer simulation.